World 3-3 is the third course of World 3 in Super Mario 3D Land. The level begins with Mario standing on a platform. Past that is a section composed of Donut Lifts leading to the next area; a Stingby can be found here. Going farther reveals several more Donut Lifts, with another platform dividing them, and another Stingby. The next platform is one large platform with a Chain Chomp on it. Afterward, there is another, lengthy Donut Lift bridge, with a Super Star on it. Next is a ledge with a Red Ring on it, followed by another set of platforms with a Checkpoint Flag in the center. A large set of Donut Lifts follows this, leading to another large platform with a Chain Chomp at its center, and a set of Binoculars nearby. 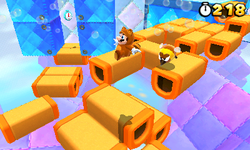 By climbing up the platforms, the player has to jump across some Donut Lift bridges to reach a Warp Box, which takes Mario to a platform of Donut Lifts. This leads to a staircase of aforementioned blocks, which, in turn, take the player to the flagpole. Star Medal 1: By using the Question Block at the beginning as a ledge, the player can get to the top of the platforms. Beyond this is a switch that Tanooki Mario can swing his tail on, causing the platform to elevate to a Warp Pipe. Going down the pipe shows the player two ledges composed of Brick Blocks. On top of these is the Star Medal. Star Medal 2: After the Checkpoint Flag, by taking the set of singular Donut Lifts, there is an area in which Mario can wall jump to get some clocks. Beyond this is a pair of Donut Lifts, on top of which is the Star Medal. Star Medal 3: Using the Binocular to spot a Toad on a nearby platform causes him to drop the Star Medal over a bridge of Donut Blocks. This page was last edited on April 5, 2019, at 18:09.